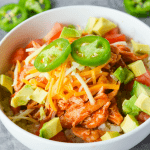 This Keto Chicken Enchilada Bowl is a low carb twist on a Mexican favorite! It’s SO easy to make, totally filling and ridiculously yummy! Who doesn’t love Mexican Food?! Okay, well I know of one person but I’m pretty sure he’s just confused. Mexican food has always been one of my favorite cuisines. Those cravings get even stronger with pregnancy, let me tell you. I’m due in just a few weeks (hooray!) so now my focus if shifting to meals that can be prepared a couple different easy ways and frozen. 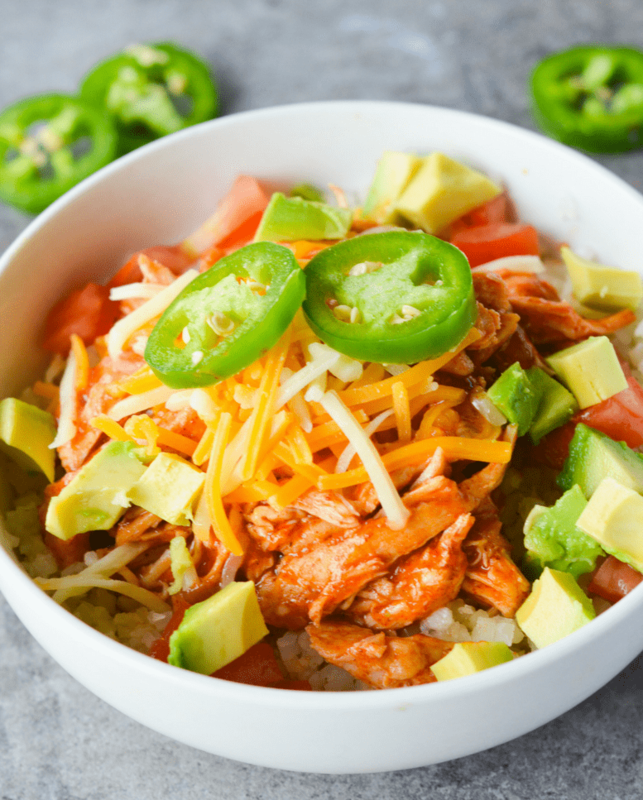 I made this Keto Chicken Enchilada Bowl on the stove top, but it can easily be made in a slow cooker or an Instant Pot by adding the chicken, enchilada sauce, chiles and onions together and letting them cook on low heat all day. The chicken and sauce mixture can ALSO be prepared ahead of time and frozen so when it’s time to reheat ( I would probably let it thaw and then heat in a pot on the stove top) you can just add a steamer bag of cauliflower rice and your fresh toppings. Pretty simple! Another option would be to make the cauliflower yourself. If you’re not familiar with the dish, it’s pretty simple…just grated cauliflower that you can prepare yourself with a fresh head and a food processor. 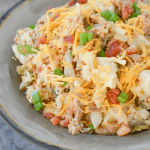 My new favorite way to prepare it is found in my Keto Mexican Cauliflower Rice recipe. Delicious! You can also make your own enchilada sauce or buy some in the store. Here’s a low carb enchilada sauce recipe if you’d like to make your own. Here’s a breakdown on the nutrition. The recipe has been updated, to make the complete recipe more clear. Remember: every body is different and everyone’s specific macronutrient goals are different. 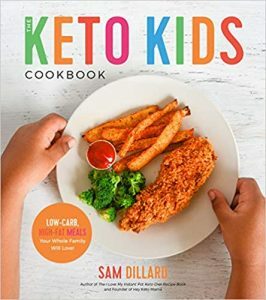 Keto is a low carb, moderate protein, high fat diet, and often followers of the keto diet will strive to hit their goals throughout a day’s worth of eating, rather than trying to hit certain percentages for each meal. Low carb meals can often be customized to meet your macro and flavor preferences. You can add more fat to this recipe by changing the amounts of ingredients such as cheese, avocado, or sour cream. If you had a fatty coffee this morning and don’t want to exceed your fat for the day, you might try swapping out the chicken thigh for a leaner chicken breast. Adjust for what works for you, and be sure to share your best ideas below! Optional: serve over plain cauliflower rice (or mexican cauliflower rice) for a more complete meal! In a pot or dutch oven over medium heat melt the coconut oil. Once hot, sear chicken thighs until lightly brown. Pour in enchilada sauce and water then add onion and green chiles. Reduce heat to a simmer and cover. Cook chicken for 17-25 minutes or until chicken is tender and fully cooked through to at least 165 degrees internal temperature. Careully remove the chicken and place onto a work surface. Chop or shred chicken (your preference) then add it back into the pot. Let the chicken simmer uncovered for an additional 10 minutes to absorb flavor and allow the sauce to reduce a little. To Serve, top with avocado, cheese, jalapeno, sour cream, tomato, and any other desired toppings. Feel free to customize these to your preference. Serve alone or over cauliflower rice if desired just be sure to update your personal nutrition info as needed. What a fun post. We love taco salads in my family and also enjoy our tacos in a bowl on occasion. I love how you put your enchilada in a bowl! Thanks for linking to my low carb enchilada sauce recipe. It’s a good one. I will share on social media. Thanks so much, Kim! 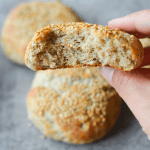 Your recipe is a great one and I love that you’re a champion for low carb living! I made this tonight and it was really good and super quick and easy. My husband loved it too. Thanks so much for the recipe! This is delish. First time I made my whole family ate it all. Making a double batch this time. Thanks. Agreed! My whole family lived this and the meal was quick and easy. I will be making this again. Love the different recipes. So hard to find some low carb stuff. Made this tonight abd it was very filling and delish! Serving this tonight with some grilled Mexican corn on the cob. I wonder if this would do well in the crockpot? I think it would work great in the crockpot! This was so quick, easy and delicious. Mine came out a little spicier than I would have liked but my husband (who is definitely not a fan of cauliflower rice) told me to keep he recipe just as is!! He is now a cauliflower rice believer thanks to this recipe!! I made it in the crockpot and it was delish! Added sour cream and shredded cheese to up the fat macros and enjoyed every single bite. Thanks for the recipe! Do I put the chicken in the crockpot raw? I would toss the chicken (raw or uncooked, whichever you want) into the crockpot with the sauce, onions, chiles and water and cook on high for 4 hours or low for 8 hours. Shred the chicken with two forks about 30 minutes before serving, add it back to the crockpot and let it finish up while you prepare the other ingredients. Then you can cook your cauliflower rice however you prefer. I usually do stovetop but there are lots of good steamer bags. Then just add your favorite toppings. Hope that helps! My boyfriend is doing the Keto diet and this is the first recipe I have attempted and it turned out fantastic. I made my own sauce but did everything else according to the recipe. We had never heard of cauliflower rice and were surprised how tasty it was. Thank you so much. Can’t wait to try more of your recipes! I needed a recipe to take to a social with a few girlfriends. None of them are on a low-carb diet, I’m the only one. I’m taking this as an entree on Friday night. I’ll let you know how it goes. 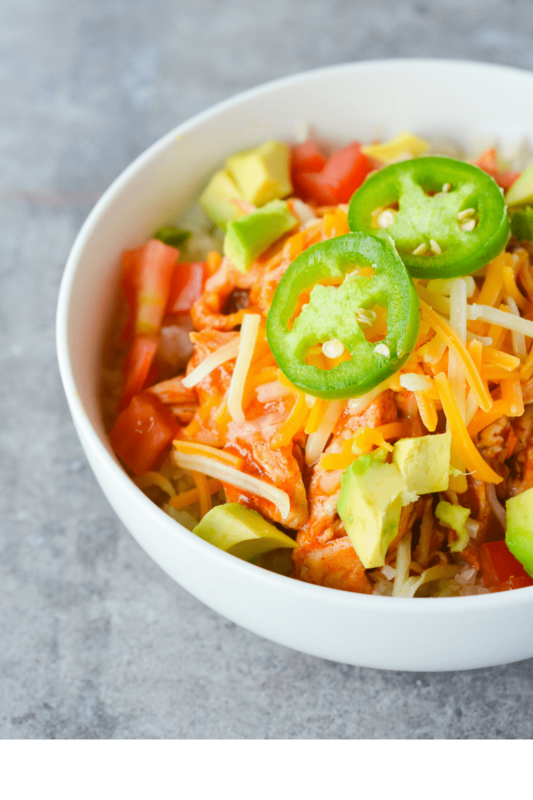 This was the easiest and most amazing chicken enchilada bowl ever! I would highly recommend this dish. Instructions were spot on. Would me making my own cauliflower rice work the same as the bagged kind? It was so good we eat it all the time. Do you have a newsletter that I can subscribe to, please? 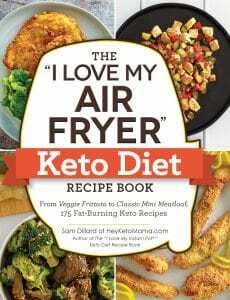 What enchilada sauce do you use that is Keto? Every one I see has added sugar. Did you make your own? Thanks!! Hi there! The homemade one linked above is by Low Carb Maven. It’s a great option! I’m trying to do keto. I just tried this dish and I absolutely love it!!! Thanks for the recipe. My daughter even loves it. I’d say it’s a winner in my home. I had some frozen organic Cauliflower rice from Costco that I wanted to use up. This recipe was a delicious and I finally found a use for that cauliflower, that without this recipe was about to be thrown out! The whole family loved it, we topped it with Colby jack cheese, cilantro, jalapeño and chopped green onion! Thank you for sharing. Such an easy go to meal! Delicious! This was simple to make and wonderful to eat. I will definitely make it again. I also made the home made red enchilada sauce. It is also delicious and a great compliment to the chicken. Super amazing! Easy. Delicious. And The best recipe ever with cauliflower rice!! Thank you and jay husband thanks you! I though I had onions but I don’t. Will this be ruined if I make without ? i know your recipe says 2-3 chicken breasts but what is it in pounds… trying to use chicken thighs instead and just don’t want to make too little or too much. Thank you! I would say about 1 pound. These chicken breasts were 6 ounces. What is cauliflower rice and where in the grocery department do I find it? This was delicious and quick and easy to make. 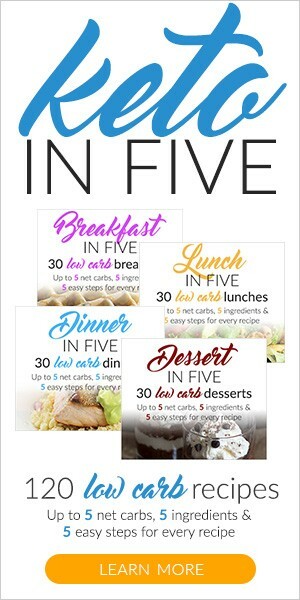 Really great for a busy weeknight! Would the enchilada sauce go well with beef chuck roast instead of chicken? Thinking of putting it in the crockpot too. Thanks! Is anyone else confused by these directions? Cook the chicken, till brown add the other ingredients, and then take out the chicken (of the sauce right?) To shred? How exactly is this achieved? A quick sear on the chicken locks in all the great seasoning you add to it. Then you leave the breast piece whole and let it simmer in the sauce. It will finish cooking and then easily shred with a fork. You can just lift out the whole pieces out with a couple forks or tongs, shred it with the forks then dump the plate back into the sauce. I made this tonight in the crockpot! I also maded your enchilada sauce! This dish is my new favorite!! Loved it! I cooked my chicken frozen and just didn’t add water to the crockpot; came out perfect! I shredded my chicken about 3 hours into cooking…… thank you so much for the recipe ???? Oh my god … just started the KETO DIET AND WAS LOOKING TO MAKE SOMETHING For LUNCH. I SAW THE ENCHIKADO BOWL AND DECUDED TO TRY IT. WELl.. what started out making enough for 2 people began to become a party of 5. One who wouldnt eat a vegetable if you begged. This recipe is beyond delicious!!! Thank you sooo much for sharing this !!! Can’t wait to make more of your meals and deserts !!!! BRAVO!!! Could you do this in a crock pot? Is the serving size a 1/4 cup or a 1/4 of the entire recipe? Made this tonight and it was great but I used regular canned Old El Paso English sauce? Is that still okay, you think? I made this for dinner tonight and both my kids and husband LOVED it! That is a very rare feat so I thought I must share my rating! YAY! Thank you! I added black and pinto beans to the recipe for extra flair and used chicken breast instead of thighs, worked out great! This was fantastic. Made for dinner tonight, with just a couple tiny changes. So easy and so delicious. Hitting those macros! 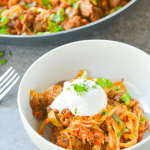 Looks good, how do you cook in the instant pot?